Not too long ago, we received a dare from our customers on Facebook, YouTube and a few different Mustang enthusiast forums. The message was clear: we want to see you race your 2011 GT and your 2012 Boss 302 at the drag strip. The timing was perfect… we had two employees beating their chests going back and forth about who the better driver is. It was time for them to “put up or shut up”, and shortly after, we headed to Cecil County Dragway for a grudge match! Let’s take a look at the drivers: Brick (The Racer)‘s job is to keep all of the Mustang parts in-stock at AmericanMuscle.com. An avid NMRA enthusiast and racer himself, we didn’t have to twist his arm to get him to bang through the gears in the 2012 Boss 302. Mike Wilson (The Tuner), from our Bama Performance Custom Tuning Specialists, is very familiar with our 2011 Mustang GT. He helped us reach the 10-second mark in it late-last year! 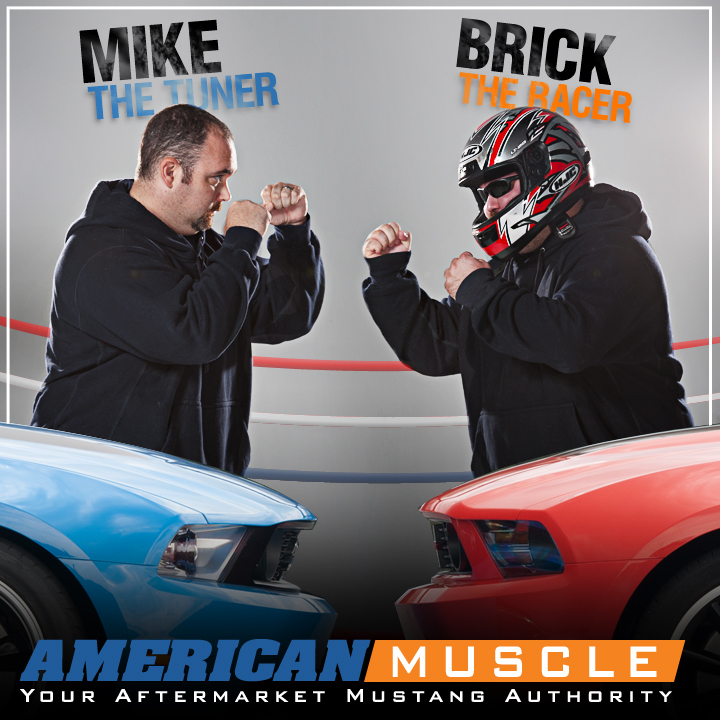 This rivalry started a few months back and after tons of trash talking, we had to settle it the AmericanMuscle way. Both cars were brought completely back to stock, and similar mods were added to give each other a fair chance! Congratulations to Brick for driving hard and killing it with a .003 light (watch close at the shifts on the third run – AWESOME)! Since filming, Mike Wilson threw down consistent 12.0-12.1 passes in the 2011 GT. He’s ready for Brick, any time, any place! The reason we chose the 2012 Boss and 2011 GT were because you guys commented and wanted to see it happen! Make sure to comment and let us know any other videos you’d like to see from the Mustang Experts at AmericanMuscle.com! Previous Entry VIDEO: Our 2011 V6 Mustang is the First in the 11’s! Next Entry Watch 5.0 Magazine Test Our 11-Second V6 Mustang! The GT was a 10 sec car last year? Why is it running 12’s? I know, right? If it was authentic Tuner vs. Racer, then both should have been on the same transmission (preferably manual, of course). A good shifting technique would give more advantage for the racer though. Will Brick be racing at NMRA Bowling Green this weekend? I hope we can see the Boss in action this weekend! We’ll be posting coverage from the races on our Facebook page http://www.facebook.com/NMRANationals and there’ll be live streaming video of the race as it happens this weekend at http://www.motormaniatv.com , courtesy of our friends at Nitto Tire. This was a lineup I wanted to see for a while, thanks for doing this run! Both very sick cars. Congrats to both drivers. The boss driver couldn’t launch that thing for crap. Cool video, I have been waiting since march for My BOSS, I plan on driving as it is supposed to be driven. You guys should take both cars to a road course and have some real fun. Mine will be at Autobahn Country Club in Joliet Ill as soon as I break it in!!! Please… if you want to do a fair race then make it fair to start with! Impressive numbers for both cars, however I would like to see them on a road course. Keep up the good work AM.